Sparky the Fire Dog in his mobile fire truck delighted the students in Tammy Ross’ Lions class and Kayla Cardwells’ Foxes at Grand Heights School this morning. 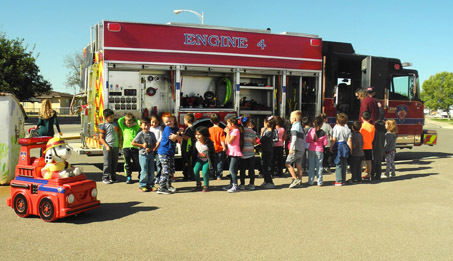 Fire Marshall Brenden Harvey and his staff are teaching area students the importance of “Every second counts”, the theme of this year’s Fire Prevention Week, which runs through Saturday, Oct. 14. According to the National Fire Prevention Council, in a fire, seconds count. Seconds can mean the difference between residents of our community escaping safely from a fire or having their lives end in tragedy. That’s why this year’s Fire Prevention Week theme: “Every Second Counts: Plan 2 Ways Out!” is so important. It reinforces why everyone needs to have an escape plan. Here’s this year’s key campaign messages: Draw a map of your home with all members of your household, marking two exits from each room and a path to the outside from each exit, practice your home fire drill twice a year by conducting one at night and one during the day with everyone in your home and practicing using different ways out, teach children how to escape on their own in case you can’t help them, make sure the number of your home is clearly marked and easy for the fire department to find, close doors behind you as your leave — this may slow the spread of smoke, heat, and fire, and lastly, once you get outside, stay outside, never go back inside a burning building.